The National Road Safety Commission (NRSC) has said there is the need to change its current awareness creation status to an enforcement agency which can demand strict compliance from stakeholders. The change of status would empower the Commission to play a major role in the award of road contracts, road engineering process and have the 'teeth to bite' partner agencies to do the right thing. Reverend Ismala Hasmittson Awudu, Chairman of the Board of the Commission, who made the call at a press conference, said there are limitations in the Legislative Instrument that established them hence the need for the change. 'When other institutions don't work then we can take them to court as an Agency and make sure they comply. We as a Board are passionate about bringing safety on the roads. 'If their stakeholders refuse to take their recommendations nothing happens. For instance, if the Motor Traffic and Transport Division of the Ghana Police Service receive a recommendation from the National Road Safety Commission to enforce traffic regulations and they don't do it, the NRSC has no power or anything to act. 'When the Roads and Highways do not put in the needed engineering expectations on the road to ensure that our roads are well constructed and safety measures are put in place, the NRSC cannot act,' he said. Rev Awudu said with the current condition of the Commission they were failing on their mandate adding that, 'Our main task is to save lives on the roads and if the lead agency (NRSC) is not well resourced then what are we doing'. He said the new Board had made it a priority that they attain the Agency status to be more vibrant and hold stakeholders responsible and accountable. Mrs Mabel Obiri Yeboah, the Executive Director of the Commission, said periodically, the NRSC conducts safety audits on the roads and make recommendations to the road agencies for redress, but such recommendations were hardly addressed. She said the Commission was worried about the situation but under its current mandate cannot do much to change it. 'For example, the Commission is not happy about the unsafe situation on the George Walker Bush Highway, Pokuase, Amasaman and the Tetteh Quarshie-Madina-Adenta road where pedestrians are always seen competing with speeding vehicular traffic and resulting in knockdowns and deaths. 'The Commission conducted an inspection of the interchange at Suhum Junction a couple of weeks ago and our observation is that there is a looming danger for pedestrians at both approaches to the interchange if facilities to separate vehicular and pedestrian traffic are not put in place now before commissioning of the road. 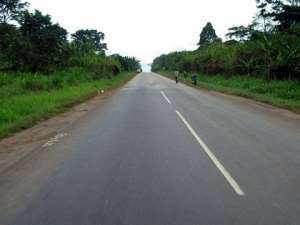 These observations have been communicated to the Ghana Highway Authority to consider,' she said.